An Empty Studio | Jennifer Pratt Equine Artist. A little over a week ago, I said goodbye to my studio companion and family member ‘Maddie’. So many friends have faced this decision before, but Maddie was my first dog. This was my first time having to make that choice for an animal. In fact, in my Maddie-love moments over the years, I would start to blubber even thinking about the day I would lose her. My husband would look at me like ‘Why are you crying? she’s right here, healthy in front of you!’ Silly I know, but she was an awesome dog. I haven’t been able to pick up a paint brush in the studio yet, as she was always so close, keeping me company. Things are different here. I thought it would be therapeutic to share a few stories about her. A tribute to my Maddie, I guess you could say. Maybe one day in the future I will paint her, but right now, I am content to look at her pictures and imagine my fingers in her fur while she looked at me with her soulful loving eyes. It is possible that I could entertain you with Maddie’s adventures in food crimes alone as there are plenty of stories. She often employed other dogs to enable her to reach whatever treat was just beyond reach. 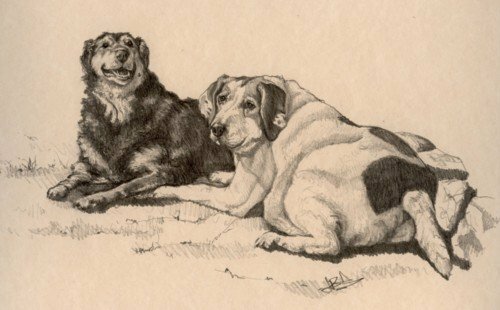 In the above sketch she is smiling with her buddy Buster, back from when we lived in Erin, Ontario. Buster, our landlord John’s dog, was famous around town for going out on garbage day and helping himself to all the neighbors trash. Together formed a formidable food stealing duo. One night in Erin, we were so lucky to have a friend come over bearing fresh seafood ingredients to make his famous seafood Paella, complete with homemade fish stock (ie, all sorts of fish parts, required) . We enjoyed food and (many) drinks with friends, forgetting about the seafood smorgasbord the dogs were likely already conspiring for. After a hangover curing, greasy spoon breakfast, we returned to a pungent odor from outside the screen door. Inside, a seafood war had broken out. Our apartment was strewn with mussel, clam shells and shrimp heads. That wasn’t the worst part, it appeared the fiercest food battle between the dogs took place in our bedroom. Under the covers, we found the components of the homemade broth. This consisted of fish heads, guts and other grizzly remains. Yes, it was disgusting. We found the two dogs, blissfully sleeping in the yard with somewhat distended bellies. Maddie and Buster also celebrated holidays together. I’ve always been told chocolate can make dogs very sick, but it would seem the stomach of steel duos could also survive helping themselves to Christmas chocolates. They made sure to carefully unwrap the Christmas paper and foil wraps on each chocolate. Perhaps this was to ensure proper digestion, or good manners in the spirit of the holiday season. In 2005 along came Aiden. Neither Brad or I were sure how Maddie would react. She was always the centre of our lives, and now she would have to share the spotlight. Well, she was pissed off. She didn’t like the situation one bit. At about 4 months when Aiden started sleeping through the night, Maddie stopped sleeping through the night. She wandered the hallway crying and restless. I don’t think she knew her place anymore. She was clearly unhappy. A dear friend on a farm with two other dogs, whom Maddie loved visiting, offered to take her for a ‘rehab’. We picked her up about a week later, an entirely well-adjusted, contented dog. In that time to clear her head, I think she realized that Aiden wasn’t going anywhere. Perhaps she had discovered Aiden would be an excellent new source of food! Aiden and Maddie grew a beautiful bond. She was his protector, sleeping with him every night, guarding from monsters in the closet and things that might lurk under the bed in the wee hours of the night. There is incredible beauty in watching a child develop a love for a pet. I hope Aiden is old enough to remember all the times he had with her into his adulthood. She also wore the badge of official vegetable garden protector. Some of you might know, I have a passion for growing vegetables. Maddie helped to ensure no cat or squirrel dare dig in my precious beds. Being a dog that loved to protect came with its downsides of course. Like the time she got skunked and promptly rolled on John’s Persian rugs to help herself alleviate the stench. Maddie aged graciously. She came back from the vet’s office on three occasions over four years with a prognosis of months to live. She showed us (and the vet) time and time again, she was not ready to accept this sentence. I made all of her dog food and looked after her senior supplements religiously. I feel great pride to know I have been a good dog mom. In the final days, Maddie still wore her smile, but she walked with a horrible limp. The day before we were to leave for a family vacation without her, her leg was becoming painful to palpate and not load bearing. A certain look had changed in her eyes. It was then we knew. She lived a long, full life. She was a member of our family for 12 years of her 14 and possibly 15 years of life. I am grateful to have had such an incredible rescue dog in our lives. Thank you for letting me share my story about Maddie. I feel better already now that more people in the world know how great she was. 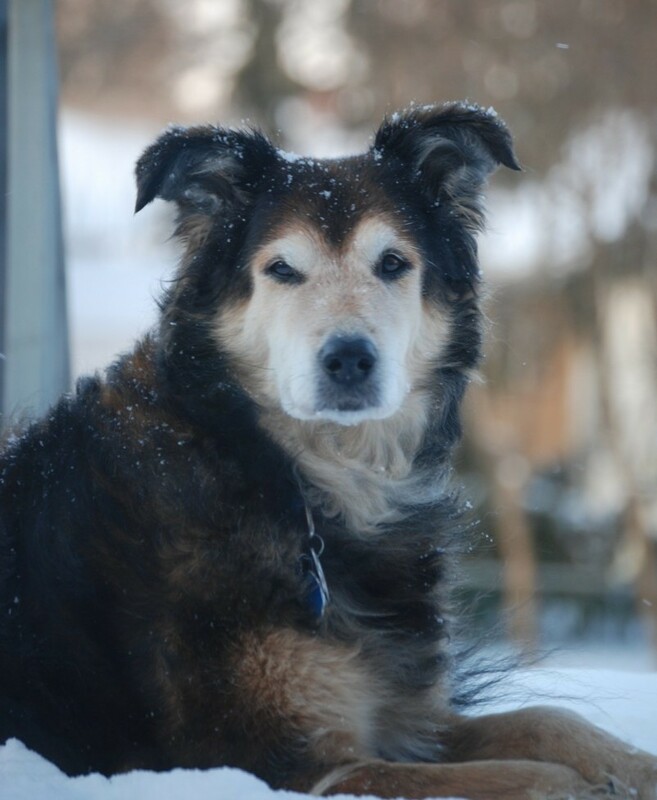 Thank you Maddie – the Best Dog Ever! Well written Jenn what a wonderful way to remember a wonderful member of your family!! So sorry for your loss!! A beautiful post about a beautiful dog. Thank you for sharing and I hope that it helped you at least a little. thank you everyone. I’m so glad you took the time to read about Maddie. I miss her so much. Dogs are amazing animals, true unconditional love. What a beautiful girl, such a beautiful story and I hope that you can continue to enjoy your happy memories with her. She was so beautiful, I would really love to paint her. Could I have your permission? I sincerely appreciate the gesture and thank you for your kind words. I would like to save the photos for myself to paint one day. I am not sure anyone else would really capture her, the way that I knew her. Thank you for asking though. how beautiful you describe the life with Maddie. Now I’m crying too… 16 months ago, when you was here in Sweden, I remember you was so unhappy, because you thought that Maddie maybe should die when you was here. You got a whole year extra! I’m glad for that. Hope you had a lot of quality time and time to take farewell, happy moments and good memories for the rest of your life. I wish you all the best and take care of each other – and I am sure that Maddie is happy now, in another dimension of life. Thank you Maria and Hakan. I was thinking about her so much on that trip. Yes, you are right, I was very lucky to have the extra time with her that I did. I think her heart would have gone on forever, no matter what pain she was in. She was that kind of dog. A very touching tribute to your dear Maddie, Jen. Thanks for sharing it. It brought tears to my eyes, having been through this a few times myself.